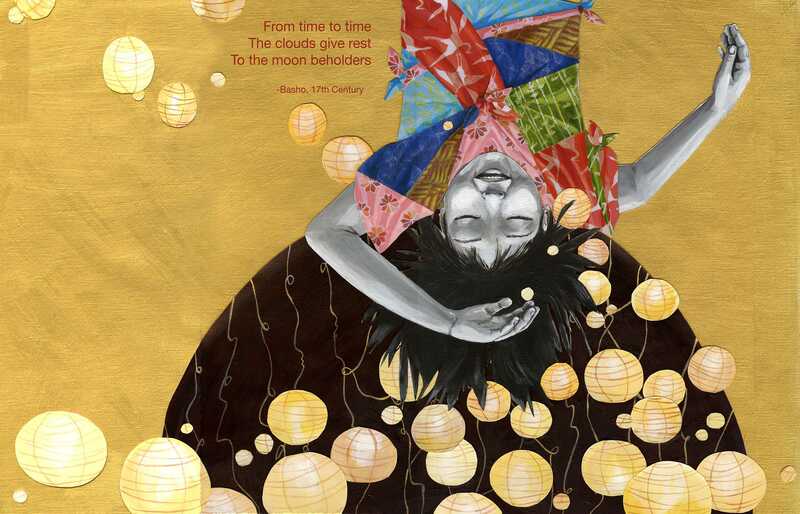 The community day of painting for the Japanese American National Museum’s recently commissioned mural, “Moon Beholders,” has been rescheduled for Saturday, Nov. 8, to coincide with the museum’s next Target Free Family Day. The mural will be painted on the north wall of JANM’s National Center for the Preservation of Democracy. Mural painting will take place from 11 a.m. to 3 p.m. Target Free Family Day runs from 11 a.m. to 4 p.m.
All ages are welcome for the mural painting. On the day of the event, individuals may sign up to paint for 30-minute intervals; up to 12 individual can paint per interval. Those wishing to participate should wear closed-toe shoes and other attire appropriate for an exterior painting project. Work will be done on the lower section of the wall, accessible without lifts or ladders. Katie Yamasaki, who designed the mural for JANM, will be present to explain the content and symbolism of the mural and to offer a simple lesson in the use of highlights and shadows. Yamasaki, who is based in Brooklyn, N.Y., has painted more than 60 murals around the world. She has also had three books published, including “Fish for Jimmy,” which she both wrote and illustrated. In addition to the painting opportunity, JANM will be offering a variety of free activities as part of its November Target Free Family Saturday. In honor of Veterans Day and Thanksgiving, many of these activities are themed around giving thanks to family, friends, military veterans, and those currently serving in the U.S. armed forces. Throughout the day, visitors will be able to write letters of thanks to military personnel, for delivery by Operation Gratitude; make origami peace doves; and design hanging autumn leaf decorations. There will also be coloring activities and a scavenger hunt, courtesy of Go For Broke National Education Center, and children will be able to sample mini-pies from Claremont’s I Like Pie Bakeshop. Documentaries about the late Sen. Daniel Inouye and former linebacker for the Super Bowl-winning New Orleans Saints Scott Fujita will be screened at 11 a.m. and 2 p.m., respectively; caricaturist Dominic Arneson will be drawing visitor portraits from 12:30 to 2:30 p.m.; and Swing Dames, a World War II USO-style singing group, will perform at 1 p.m. Hello Kitty will be present to share hugs from 3 to 4 p.m.
Target Free Family Day includes admission to JANM’s ongoing core exhibition, “Common Ground: The Heart of Community,” which chronicles 130 years of Japanese American history. Admission to “Hello! The Supercute World of Hello Kitty” is not included; those wishing to see “Hello!” must purchase tickets and advance purchase is strongly recommended. JANM is located at 100 N. Central Ave. in Little Tokyo. Local parking information is available at Metro.net. For more information, call (213) 625-0414 or visit www.janm.org.